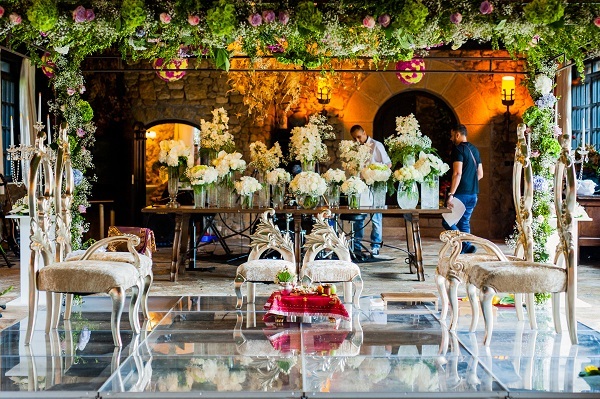 Pomegranate Event Decor planned, designed and executed a 4-day destination wedding in Bilbao, Spain, last month. The creative brain behind the agency is well known Wedding Designer Gayatri Sekhri. 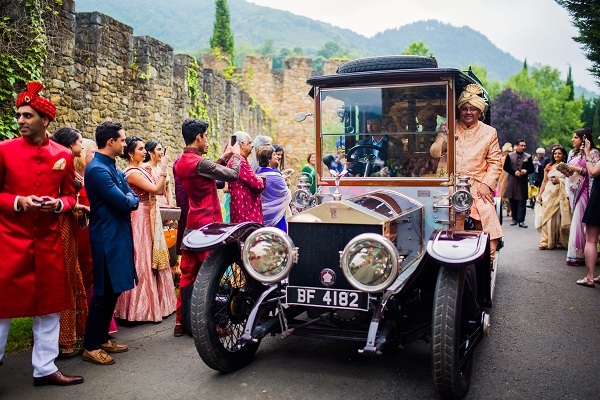 An excellent option for a destination wedding, Bilbao, in the Basque country, is a prime example of urban restructuring, having transitioned from an industrial city to a city of services and culture. Thanks to its history and location, Bilbao is a magnificent cocktail where architecture, tradition, sea and mountain, character and history are blended to offer the visitor endless leisure and cultural opportunities. The Botxo (Hole), as it is fondly known to its inhabitants, has now matured into its role of major European art centre. However, in doing so, it has not forgotten its past; at heart it remains a hard-working town with a real character. It’s this down-to-earth soul the real attraction of the vital, exciting and cultured city of Bilbao. The celebrations commenced on June 22. Wedding guests mingled in the Guggenheim Atrium with music, drinks and typical basque region food. This was the perfect start to this Spanish extravaganza. Guests were enthralled by Spanish music and tango dancers. Additionally they enjoyed the art on display from some of the most famous artists from around the world. 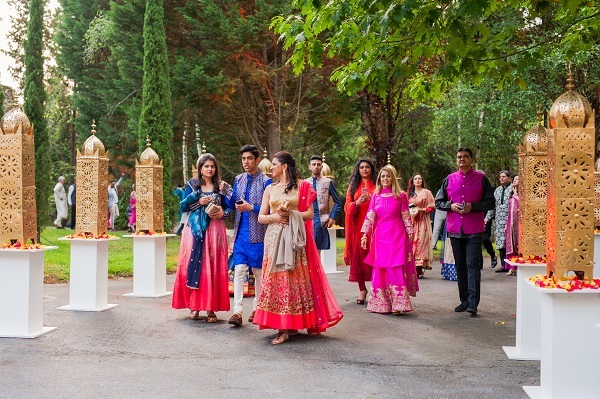 The venue was truly a stunning location for the Moroccan and Indian inspired décor that Pomegrante created! Beautiful arches adorned the performance stage with LED screens and intelligent lighting. Moroccan tents in orange, red and white set up for the two bars. 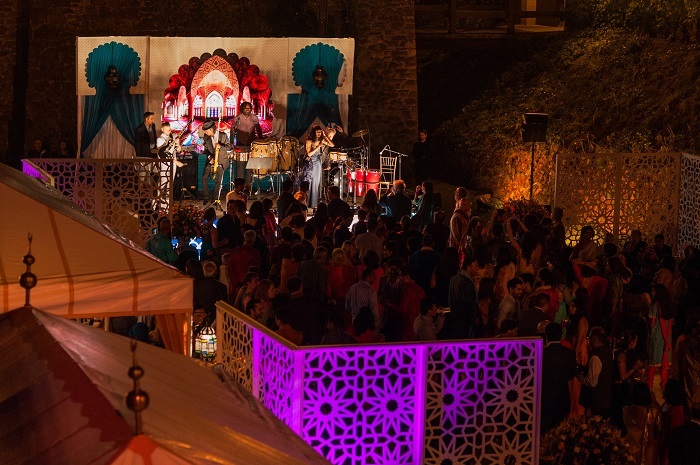 A Jali courtyard was created for lounging and dancing in front of the performance stage.Two giant floral walls made with fresh flowers served as the backdrop to the party. A buffet dinner was displayed in the tower with Moroccan hangings and stunning florals that combined fresh fruits and flowers. Exotic authentic Spanish food such as paella and roasts lambs was served as starters, followed by typical Indian Punjabi fare. 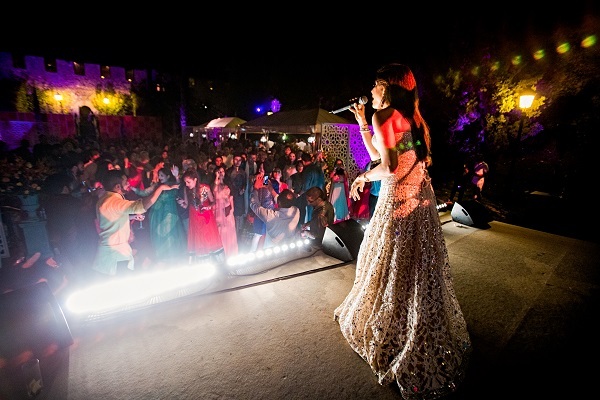 The very talented Kanika Kapoor enthralled the guests with her popular Bollywood tracks along with Famed DJ Raj from London. 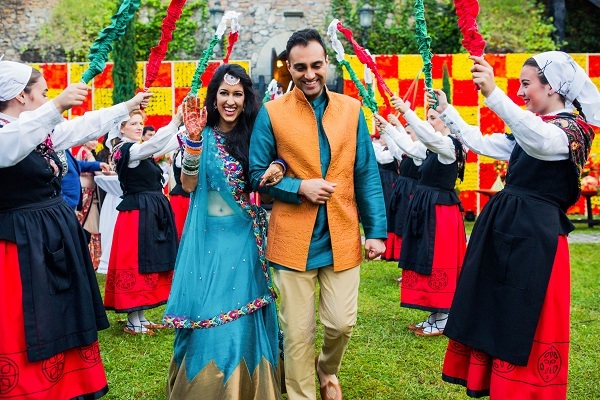 This beautiful hindu wedding took place inside the castle. 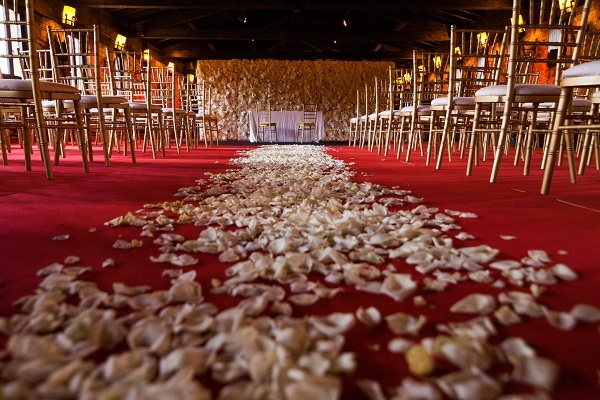 The aisle was adorned with arches, florals and crystal candle abras. The bride walked under these arches to reach the mandap that was decorated in delicate pastel colours with exotic fresh flowers such as chrysanthemums, orchids, English roses, tulips, etc. A gujrati folk singer sang melodious folk songs in the backdrop. 300 guests sat to watch the traditional wedding ceremony. Guests enjoyed a fabulous buffet of Traditional Gujrati food post the ceremony all catered by Josh Arora, of Pink turban in London. The bride and groom started the evening with a registry/ civil ceremony in the tower. 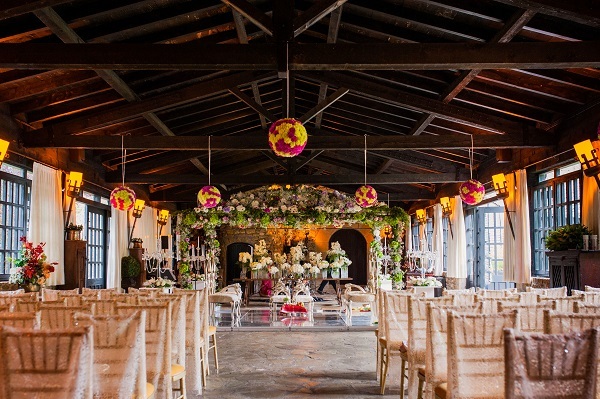 The backdrop was a white wall of flowers and exotic flowers sprinkled all across the aisle. Following the ceremony guests enjoyed a champagne reception in the Rolls Royce museum where they enjoyed the vast collection of vintage cars and their history. The guests were then escorted to the huge dining rooms, where they enjoyed a 5 course meal all catered by Michelin starred spainish chefs. 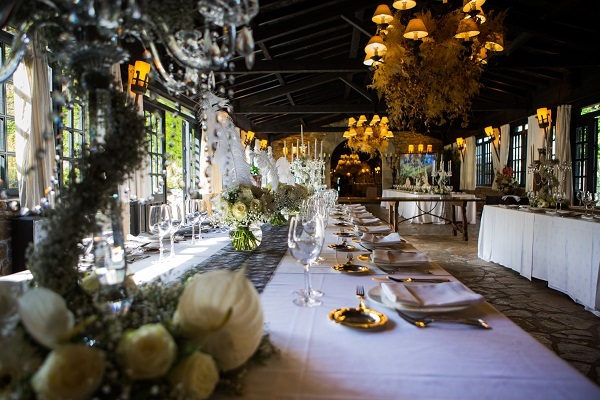 The tables were laid out with crisp white linen and black lace runners. Big floral vases with ostrich feather and exotic fresh flowers decorated the tables. Crystal candle abras and candles were displayed on the tables to add to the Gatsbytheme. Since the 20’s are a rage currently, the family chose a Gatsby theme for the evening. 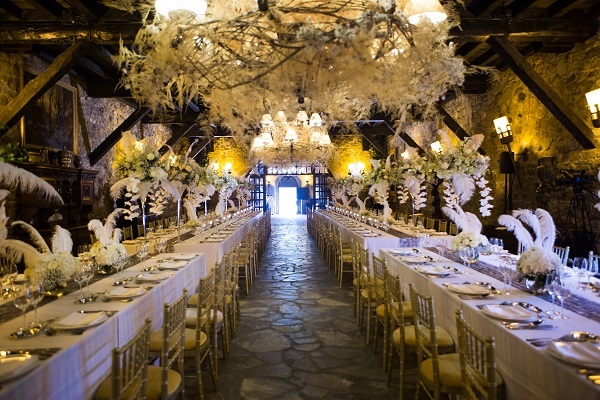 The Ballroom was decorated with a white floating tree with florals and crytals. The stage with a Art deco print served as the backdrop. Luxurious white sofas were used to create lounges. The dance floor was a very special art deco print on glass all illuminating from the intelligent lighting given in the ballroom. Here the bride and groom enjoyed their first dance and cake cutting. Dj Raj entertained the guests along with a jazz band and Charleston dancers in flapper dresses. Further they assisted the agency with a hospitality desk at the airport itself and the guest baggage was delivered directly to their rooms in various hotels. The municipality also assisted with shopping coupons, maps and tourism related hampers for each guest. Pomegranate Event Decor used multiple suppliers, ranging from trussing, stage, light, sound and furniture. All these myriad of things were brought together for the wedding functions. “Tourism authorities can help with production assistance, maybe have tie ups with bigger suppliers of furniture and production equipment from bigger cities like Madrid and Barcelona. 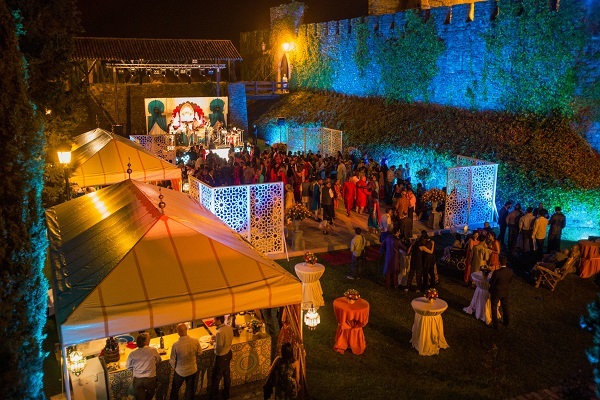 There is always a need for suppliers, as Indian weddings are at a much bigger scale than what Bilbao is used to. “, added Sekhri. Beyond Bilbao’s Guggenheim Museum, there’s really too much to explore!